/ What’s a vow renewal ceremony and when is a good time to have one? One type of ceremony that I absolutely love conducting, which I don’t talk about not nearly enough, are vow renewal ceremonies. A vow renewal, simply put, is when a couple who are already married, carry out a new ceremony to renew and refresh their promises and their commitment to each other. The vow renewal landscape has changed so much in the last few years and vow renewals have moved far away from how they used to be considered. For some, a vow renewal often suggested that something had gone wrong in a relationship and that renewing vows was a way to start afresh and to move forward with their marriage. And yes, whilst this might be the case for some couples, for most couples a vow renewal is simply about celebrating their love and their marriage and giving themselves a well deserved pat on the back for being together, staying together and remaining an awesome team through the years, which is not always easy with all that life can throw at us. Nowadays the time frames for vow renewal celebrations have changed too, and whereas there are still many couples who choose a significant milestone to celebrate and renew their vows, say a ten year anniversary, a lot of couples often plan a vow renewal ceremony simply because they have a feeling that it is something that they want to do, regardless of how long they have been married. I personally have seen couples renew vows after one year of marriage, three years of marriage and another, 7 years of marriage, so there are no rules as to how long you have been married before renewing your vows. You simply do it when the moment takes you and when it feels right for both of you. So in answer to my original question, there really is no ‘good’ or ‘right’ time to renew your vows, and it’s just down to you and your loved one to decide when the time is right for you both. How do vow renewals differ to marriage ceremonies? Firstly, the biggest difference between a vow renewal ceremony and marriage ceremony is that a vow renewal is not a legally binding ceremony. You are already legally married and so a vow renewal is a celebration of your marriage. And this makes it utterly wonderful, because the emphasis is on the word ‘celebrate’. You’ve done the legal bit, now is the time to pour your heart and soul into your new ceremony, especially if you didn’t the first time around, perhaps because of the type of marriage ceremony you had. The format of a vow renewal ceremony, whilst can be similar to that of a marriage ceremony, is yours to design as you please. Most of my couples use the opportunity to write their own vows, something which many of them didn’t get to do the first time around and so are beyond excited to do it for their vow renewal because it will be the first time that they actually get to express their love in such a way. This is your time to include your favourite songs, perhaps share some memories or talk about some of the highlights of your marriage, include your children, if you have them, and bring other family members or friends into the celebration, too. I led a vow renewal ceremony once to celebrate a couple’s 20 year anniversary and their best man from their original marriage ceremony delivered their new rings for the vow renewal, which was really lovely. Many couples like the idea of including a symbolic ritual, like a hand-fasting or candle ceremony, too. It’s your chance to celebrate your marriage, however you want. This also means that you have so much freedom with your location too. Maybe you want to return to the area or even the same place you got married at, or you want to do it somewhere completely different, a different area, or even a different country. Maybe you want it to be just the two of you, or maybe you want it to be a bigger, family-centred celebration. Whatever you like! Do you exchange wedding rings at a vow renewal ceremony? It’s always nice to have an excuse for a new bit of bling, and a vow renewal ceremony is of course a perfect occasion. However, it’s not compulsory or necessary and many couples renew their wedding vows without exchanging new rings. I’ve had couples who had matching anniversary tattoos in place of new rings, or gift exchanges during the ceremony. So whilst a new ring is lovely, it isn’t needed unless you fancy some new jewellery. Whatever the hell they like! Is the answer to that question. But seriously, it’s true. Yes, some couples stick with the true bridal theme and wear bridal or evening dresses in the traditional bridal colours of white or cream and grooms wear suits, but many wear whatever takes their fancy and in general the dress code is less formal than that of a marriage celebration. There are NO rules. What about surprise vow renewals? 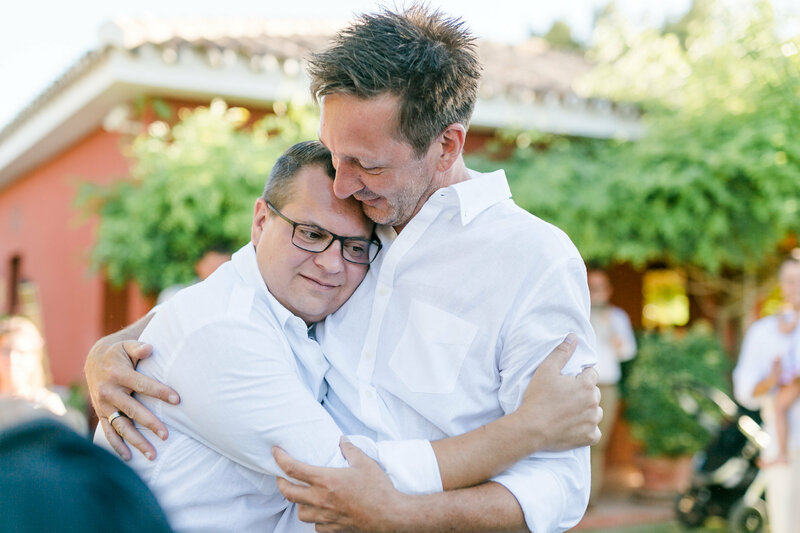 Surprise vow renewal ceremonies can mean a vow renewal where one partner surprises the other with the renewal or where the children of the couple organise a surprise renewal for their shell-shocked parents! I’ve been lucky enough to see the results of both types of surprise and they were both magical. The first was a husband who had organised everything without his wife knowing. They were on a cruise with their children and their children’s partners (who were all in on it) and they stopped off in Gibraltar for the day, where I was waiting for them in an events room on top of the Rock of Gibraltar. A wedding planner had set up the ceremony space and when the couple walked in the bride was talking about how pretty the room looked but that they should leave because it looked like a ceremony was about to take place. And I said to her that she was right, and it was her ceremony!! Then their favourite song played out and as you can imagine the tears starting to roll. It was really lovely and very special. And in the second, the four children of the couple organized the 40th anniversary vow renewal for their parents. They were holidaying together with all the family, the parents, children and grandchildren. I suggested to the children that they tell their parents in advance, so they told them the day before the ceremony, which gave them time to put some thoughts together and to write their own vows. They were so touched and honoured and afterwards had said it was the best thing that they’d done and were so happy that their children organised it, because they probably wouldn’t have done it themselves. Whilst I love love love surprise vow renewals, I am also very cautious at first and whenever I get an enquiry about them, I try to make sure that either the children of the couple or the other partner are 100% confident that this is what their love bunny/parents would want. Everyone always has the best intentions when it comes to renewing vows, always, but sometimes it might be the case that for the couple themselves, a vow renewal might not be what they need or want. Sometimes a vow renewal is thought up as a way of healing a rift or solving a relationship problem and this is absolutely wonderful if that’s what both people want, but if it isn’t, you do really need to think twice before surprising your partner or parents with a vow renewal. Vow renewal ceremonies really do give couples the chance to celebrate their love, especially nowadays in our fast-paced, busy lives where we don’t get a chance to stop and appreciate all that we have and our gratitude for it, and our deep love of it all. And vow renewals allow this appreciation to take place and to be formally and lovingly recognised by the couple and any family or friends who might be celebrating with them. Have you got plans to renew your vows? How would you like to do it? Tell me in the comments below, I’d love to hear about them.